With room for 14 passengers and a crew of three, our Cuba Catamaran hits the sweet spot between spacious and cozy. Stylish looks spread across 25m (82 ft) of twin-hulled sexiness, you'll find plenty of interior and exterior space to lounge about when you're not exploring Cuba's shores or diving into her crystal-clear waters. Cuba Catamaran is equipped with 7 passenger cabins some with 2 beds (upper and lower) and some with double beds. All cabins have attached bathrooms with showers and the vessel has an onboard kitchenette, interior and exterior common areas and plenty of outside deck space. If you are traveling alone, you will be paired up in a cabin with another traveler of the same gender.Please expect them to be very small. The bunk length is 1.8 meters ( 6ft) with limited head height and limited storage for luggage. Most of of our sailors tend to spend very, very little time in their cabins, just using them to sleep and store clothes. 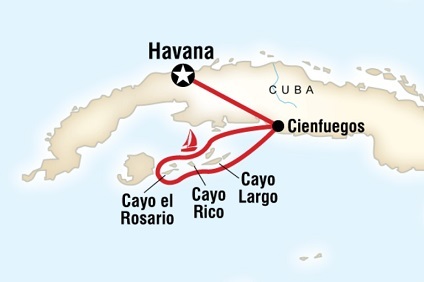 7 Night Cruise sailing from Cienfuegos roundtrip aboard a Cuba Catamaran. Cuba Catamaran is equipped with 7 passenger cabins some with 2 beds (upper and lower) and some with double beds. All cabins have attached bathrooms with showers. If you are traveling alone, you will be paired up in a cabin with another traveler of the same gender.Please expect them to be very small. The bunk length is 1.8 meters ( 6ft) with limited head height and limited storage for luggage. Most of of our sailors tend to spend very, very little time in their cabins, just using them to sleep and store clothes.